...when you could recycle the recycling? In other words, why clean up when you could play pirates? If you have children, a creative mind and a sense of adventure the imagination you find here would be crystal clear, swashbuckler. ???? I have children and I am still confused? What you lack is a creative mind and a sense of adventure but I wouldn't hold that against ya. 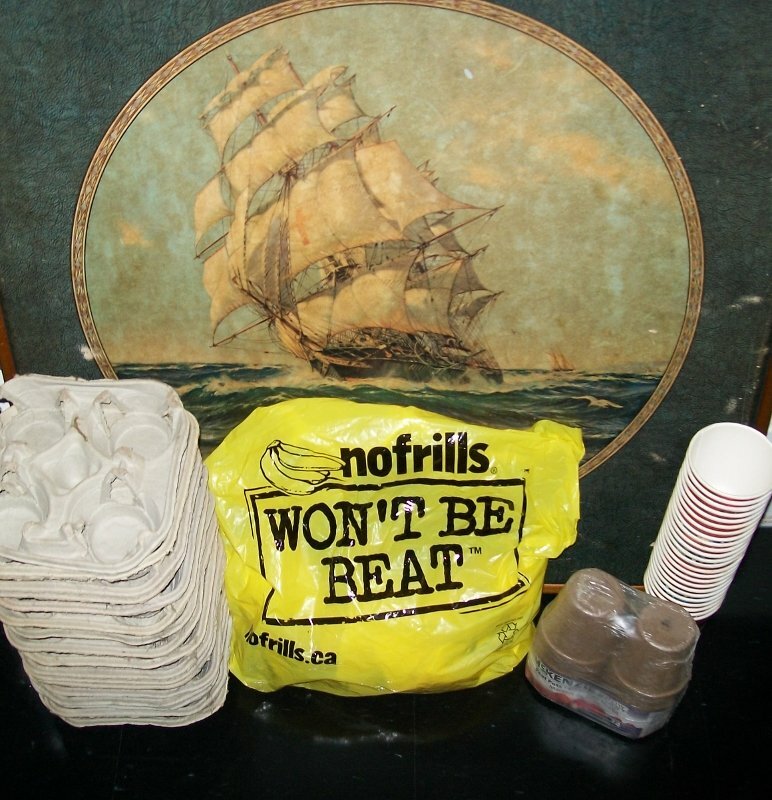 So in the spirit of Michelle's photo essay and Undustrial's instructables, I will portray my own how-to as I play recycle the recyclables. These are the raw materials I use every year to start my seed indoors because after all, I'm a gardeneer! 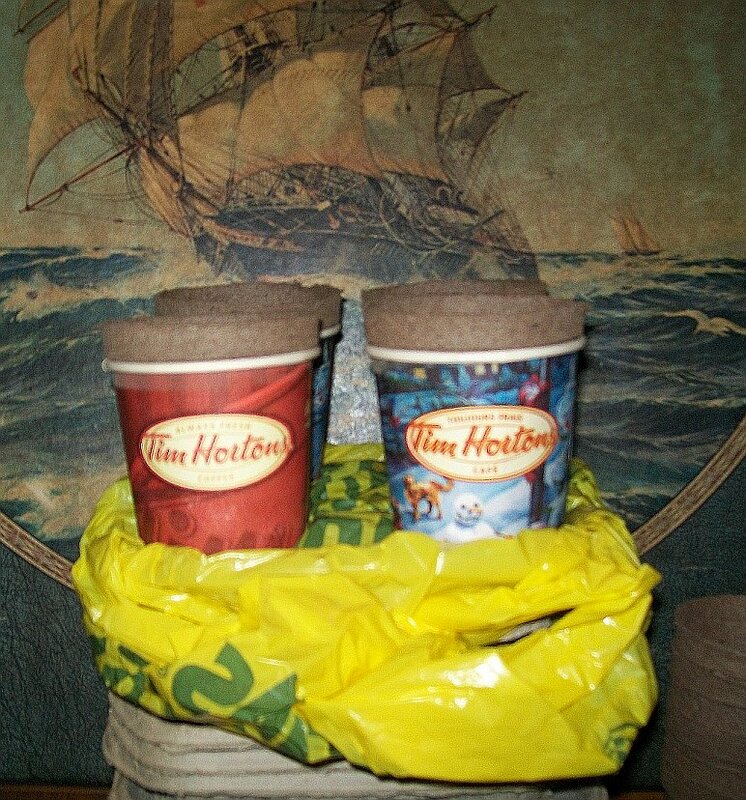 I place the plastic over the carrier to protect from moisture and I put the peat pot in the cup to help keep IT moister. Then I fold the bag over and create a little tent and this acts like a greenhouse, at least that's my intent. I keep my peat pots all cozy and warm in their huts until the seed germinates and tiny plants begin to pop-up. 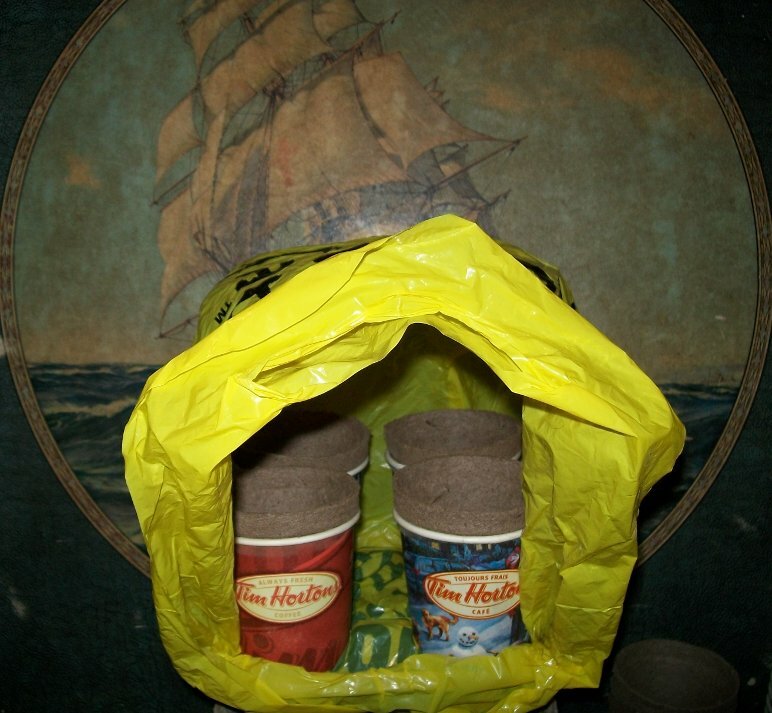 Then I roll back the bag (not the rim like at Tim's) so the prize of sunshine may spill all the way in. I hope the content of my comment will be useful to other people. I only intend to be playful much like the author Michelle. It really isn't that hard. There isn't a piece of garbage you can name that isn't useful in some way (though some more than others). The young fellow who built the pirate lean-to also has the responsibility of keeping our recycling sorted. Guess he took advantage of his position to design a game- cost us nothing, not even an inch of closet space, and no clean-up to speak of. A rhyming, recycling gandeneer... awesome. A rhyming, recycling gardeneer... awesome. I'm still figuring out how to write Hamilton right Mr. Somers, but I'm glad you didn't call me a poetic, pathetic poemer because that would've been a misnomer! Interesting. I think what you do it’s really good for children as they associate recycling with “fun” instead of “troublesome” or “something only crazy green peace people do”. When I was a child, plastic carriers would be turned into kites and old hats turned into sleeping quarters for kittens. It’s activities like these that you start to appreciate the value to things. I think right now, the disposable culture is way too strong. I've seen teenagers discarding perfectly working phones because of a new found trend. It’s sick – almost like a virus. The carrier of this virus is of course advertising and peer pressure. However, if kids grew up thinking recycling is cool, they should not be affected so easily.